Blue Sky Disney: Eisner Mounts Hostile Takeover Of Walt Disney Company! Eisner Mounts Hostile Takeover Of Walt Disney Company! Not funny. You about gave me a heart attack there. Oh my God, you got me! My heart was hammering! haha that was seriously good. got me. Best April Fools' Joke In A Long time. Great JOB. I believed you. 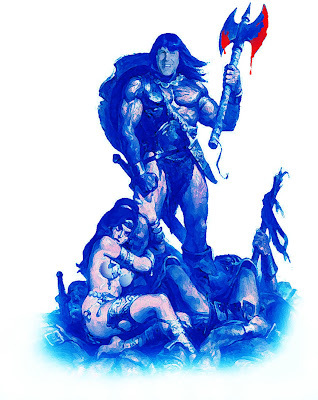 Is that Eisner as Conan? Seriously funny! Kind of like Barbarians at the Gate kind of? Good job pulling the wool over our eyes, Honor! Be careful with you pranks....you don't want to give him any ideas! My computer froze-up before I got to the end of the "article"...Panicked, I called my broker and sold all of my Disney stock! My computer's working again...and I just finished your "post"...oops! Great april fools, Honor, you got me! really! April Fool's Day is the most annoying day of the year. Plus, it can be annoying since with every Internet prank, there are always a bunch of slow people who just don't get the point that its just a prank. Remeber folks, on April 1st, you can NEVER be too careful. HAHAHAHA!!! I believed you. I was thinking, "WTF? NO WAY!!!" That was a good one.